A well-developed public infrastructure and a functioning public sector are backbones for prosperity, welfare and economic growth. There is a constant struggle to find good answers to the present challenges of modern societies in a more and more globalized world. There is an ongoing debate how to make public service delivery more efficient and effective and how to design regulatory frameworks of countries and supranational entities for supporting societal well-being in the best way. In the past decades we have seen successful and less successful approaches to modernize the public sector. One big reform impetus can be linked to New Public Management with its idea to make the public sector more market- and citizen-oriented. Privatisation, new governance structures, and a plethora of management tools such as accrual accounting, contract management and performance management are part of the reform agenda which also includes a re-design of the regulatory frameworks, among them taxation and fiscal reforms as well as the emergences of new regulatory agencies. 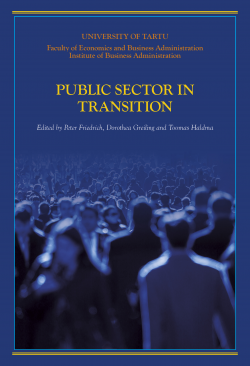 The book takes stock of current public sector reforms in the Baltic States and elsewhere. By providing an insight on the effects of the reform agendas in seven countries as well as the European Union the book addresses the transformation agenda in an international comparative perspective for researcher, political decision makers as well as students of economics, public finance, business administration and social sciences.